The JetBoils are extremely light, to be sure, and anyone trying to use one to cook for multiple people is crazy (they really are made more for the solo hiker), but a large black mark in my book is their (claimed) need for JetBoil’s proprietary fuel mix. This reminds me of the old days back at the Radio Shack when the annoying, slovenly nerds behind the counter would insist that their crappy electronic gizmos would run best with Tandy batteries. In the _very _old days, customers of Radio Shack were probably smart enough to know that 1.5 volts is 1.5 volts.. but I digress. No, somehow – and I admit this is probably slightly irrational – I just don’t like the idea of carrying pressurized gas around, or even white gas. Another black mark is the high cost: $99 everywhere (does Steve Jobs handle their price controls? ), plus more if you want accessories like coffee presses and such. On the other hand, the Trangia kits are designed around an alcohol burner whose design goes back to 1925. Sure, denatured alcohol has fewer BTUs than the other fuels, which means cooking takes longer, but in my case, this isn’t a factor, not to mention that suitable alcohol can be obtained almost anywhere. And indeed, as the title of this post implies, I bought a Trangia kit that is also known as the “Mini Trangia”: it is simply the burner, a pot, and a non-stick pan. Only for $35. Since the burner is sealable, I can fill it with fuel before a trip, and get multiple burns from it before having to use any of the extra fuel I’ll carry in a small plastic bottle. 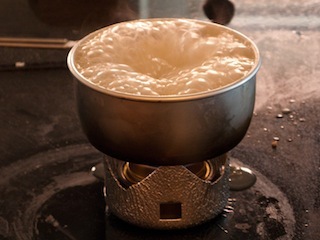 My tests on a perfectly frictionless surface (okay, my stovetop) show that this thing can boil water in ten minutes. Hey, I don’t think boiling water in the kettle on my stove is any faster! Of course, out in, shall we say.. imperfect conditions, performance might be quite worse. I’m going to try a real test very soon.